WHAT IS THE FIRST STEP TOWARDS ADOPTING A RESCUE FROM THE GSMDRF? Please complete and submit a GSMDCA Rescue Pre-adoption Application, which can be printed out from our website or can be competed and submitted online. WHAT IS THE WAIT TIME TO GET A DOG? There is no average wait time because we never know when a dog will be available in your area. If a dog comes into rescue that we feel would be a good fit for your household, we will call you to discuss the possibility of adopting at that time. We do not use a waiting list because we work to match the dog to the family and geographic location. HOW LONG DO YOU KEEP MY APPLICATION ON FILE? Applications are kept on file for two years. After that, you will need to submit a new application if you still wish to adopt a rescue Swissy. Also, we would appreciate notification if you no longer want to remain on the wait list. WHAT HAPPENS WHEN YOU GET A DOG THAT LOOKS LIKE A GOOD FIT FOR ME? We contact prospective families when we think we have found a match for you. If you are still interested in adopting and we all feel this is a possible match, we will give you the foster caregiver contact information so you can find out more about the dog. If the foster caregiver, members of the foundation and you and your household think it is a good match, we will try to arrange for you to meet the dog in person. WHAT IS THE NEXT STEP IN THE PROCESS ONCE WE ALL AGREE THAT THIS IS THE RIGHT DOG FOR US? In finalizing the process, the adopter signs a Release of Liability and a formal Adoption Contract. Any known pre-existing medical or behavioral conditions will be noted on the liability release. ARE THERE ANY COSTS IN THE ADOPTION? An adoption donation ranging from $200-$600 is requested at the time of the adoption. This donation is used to offset medical and other costs that the foundation incurs. Actual expenses incurred for your dog may have been significantly higher than your donation, but our fees remain in this range. The cost to bring your Swissy home is only a small portion of what your dog can cost during its lifetime. Please consider this prior to adopting. WHAT HAPPENS WHEN WE TAKE THE DOG HOME? You will have names of members of the foundation who can be contacted for assistance for the life of your dog. You should never worry that a question is too trivial to be asked. 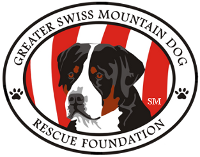 Adoptive homes will also receive a free one-year membership in the Greater Swiss Mountain Dog Club of America, which includes the Club's quarterly publication The SENNtinel. The GSMDRF will periodically contact the adoptive family to make sure everything is going smoothly. We love pictures and would ask that photos be sent as you and your Swissy come together as a family! I HAVE SMALL CHILDREN, IS THIS THE RIGHT CHOICE FOR ME? One of the top reasons Swissies are surrendered to rescue is because people with small children either cannot handle their Swissy and children, they cannot afford the expenses, or they don't have time for both. Families will often tell us they were sure they could handle it but, in the end, they could not. Please consider this when making the decision to add a Swissy to your family. Before surrendering a Swissy to rescue, many families will try keeping their Swissy and kids apart from each other. This is a situation that will never work because Swissies need and want to be with their families. It is imperative that families teach their children how to behave around a large dog and to respect the dog. 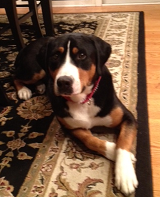 If you won't feel comfortable having your Swissy integrated into your family life, this is not the dog for you. WHAT KIND OF HEALTH ISSUES SHOULD I KNOW OF WITH THIS BREED? Becoming knowledgeable about the GSMD's health issues is very important. Please visit our health resources pages (when available) or go to www.gsmdca.org to read about possible Swissy health issues. If you adopt one of our rescue dogs and it later develops a health issue (e.g., incontinence, epilepsy, bloat, torsion, etc. ), we would expect you to provide the dog with all medical needs and care for it for the rest of its life. Please consider the emotional or financial toll such medical conditions can exact before submitting an application. Everything from food to medication to anesthesia will cost more for the life of your dog due to their size. Because Swissies are a large breed, they are prone to joint-related problems such as OCD, as well as hip & elbow dysplasia. Additionally, they are prone to bloat and splenic torsion - both of which are life-threatening and require immediate emergency veterinary care. Epilepsy and urinary incontinence appear in this breed as well. Please visit www.gsmdca.org for more information about health concerns. WHAT IS THE TEMPERAMENT OF THIS BREED LIKE? Becoming knowledgeable about the GSMD's temperament is important. These dogs can be very stubborn and some have a high prey drive. Socialization with two and four legged strangers is very important to your Swissy's training. Although many Swissies are very easy going they are not tri-colored labs, and most didn't become the happy easy going dog you may have seen without a lot of work by the family! A Swissy loves to please their family and nothing makes them happier, but a happy, loving Swissy can still be a stubborn adolescent at times. So it is important that inappropriate behavior be addressed quickly. DO GREATER SWISS MOUNTAIN DOGS NEED A LOT OF EXERCISE? Although these dogs are not considered 'high-energy', they do need some daily exercise in order to prevent unwanted behaviors such as idle barking, chewing, digging, etc. This is true of any breed, not just Swissies. Lack of activity will cause dogs to become bored and they will develop undesirable habits. If you honestly do not have the time to commit to providing a dog with consistent, daily exercise, please do not submit an application. CAN MY DOG BE A GUARD DOG? Swissies are not guard dogs. They will alert you to a stranger or something strange that wasn't there before like a trash can, lawn mower, etc by barking but a Swissy should never bite. DO I NEED A FENCED YARD BEFORE ADOPTING A DOG FROM THE FOUNDATION? We expect you to have a fenced area to contain your Swissy when outside, even if you live on acreage. WHAT ARE THE MOST COMMON REASONS SWISSIES END UP IN RESCUE? Most Swissies are re-homed due to medical or behavioral issues. Some need to be re-homed because of a change in the family's situation such as a divorce or the family having children after thy owned their Swissy. WHAT IS THE AVERAGE AGE OF A RESCUE SWISSY? Although we do occasionally have a puppy, most dogs are older with the average age between 3 and 7. CAN I GET A SWISSY THAT IS HOUSEBROKEN, WELL-TRAINED, GOOD WITH KIDS, LIKES CATS, AND IS HEALTHY? Occasionally, rescue does re-home Swissies that fit this profile but the more likely scenario is a dog that either has medical or behavioral issues. Many times the behavioral issues clear up when the dog is placed in another environment, but not always. It also can take several months for a rescue dog to fully adjust to its new home and environment. Most rescues are on their best behavior when first adopted. Once comfortable in their new home they may try to see what they can "get away with." So it is very important that the adoptive home be aware of changes in behavior and act quickly to correct any unwanted actions. This is why rescue works very hard to place the rescue with the right home environment. We rely heavily on the foster family's evaluations when considering an adoptive home. Yes. Swissies have a double coat and, as a result, they shed quite a bit. Swissies take a long time to mature. They are considered 'teenagers' between the ages of one and three years, and fully mature around age three. It can take up to ten months or longer to potty-train a Swissy puppy and some Swissies remain a "puppy" all of their adult life. HOW LONG DO SWISSIES LIVE? Swissies are considered 'senior' around age seven. Healthy Swissies should live 9-10 years, but many have lived to be 12 or 13. IS MY DOG GOING TO NEED TO BE SPAYED OR NEUTERED? In most cases, your dog will come to you after we have already had them sterilized. In some rare cases, a veterinarian may ask us to wait until some future point to perform this procedure. If your state law allows, we will make arrangements with you on a case by case basis should this need arise. Your dog will be microchipped when you receive your dog from the foundation. The chip will be registered to rescue and to you and included in a 24 hour registry service. I NEED TO SURRENDER A DOG TO YOU — WHAT IS THE PROCEDURE? The first step would be to contact rescue@gsmdrescue.org and a volunteer will call and talk with you about the situation. Rescue cannot take a dog without the breeder first being notified of the situation. We are happy to make that contact for you. If a breeder is unable to take their dog back, then we will ask you to complete a pet questionnaire about your dog. If rescue feels that your dog can be placed we will ask you to sign a transfer form surrendering the dog to the GSMDRF. Rescue will take dogs with health issues and temperament issues that we feel can be worked through, but it is most important that all such issues be brought to our attention and thoroughly discussed. I AM WILLING TO BE A FOSTER HOME FOR RESCUE — HOW DO I HELP? Please complete the online foster application. Then if we have a rescue in your area that needs fostering we will contact you. We prefer to have foster homes who either currently have a Swissy or who have owned one in the past. A foster who understands the Swissy temperament can give a better assessment as well as work to correct any unwanted behaviors. Foster caregivers are a very integral part of rescue and we rely heavily on their opinions when placing the dog. However, it is not the job of the foster home to find a home for their foster Swissy. Rescue usually has several potential homes for your foster so if you know of someone who would be interested, they may complete a pre-adoption application and be given the same consideration as the other potential adoptive homes. It is important that this potential home understands that they will be considered just as all others. I CAN NOT FOSTER OR ADOPT BUT STILL WOULD LIKE TO HELP — HOW CAN I DO THIS?